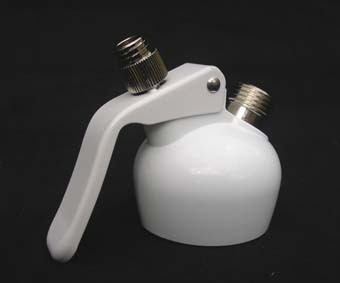 Cream Whipper Plastic Replacement Head. This spare part is with all of the standard 8gm sized cream whippers that are sold by Cheeky Monkey Cream Chargers. It will fit all Mosa and BestWhip 8gm whippers. This replacement plastic head incompatible with either the 16gm sized or professional whipping systems. The plastic head comes complete with a hot/cold heat resistant gasket. Please note, these are not designed for the heavy duty use associated with professional and catering kitchens – for this purpose we strongly recommend that our customers purchase a stainless steel whipper. Wash the plastic whipper head and warm sopay water and never use a dish washing machine. Cream Whipper Plastic Replacement Head. This spare part is with all of the standard 8gm sized cream whippers that are sold by Cheeky Monkey Cream Chargers. It will fit all Mosa and BestWhip 8gm whippers. This replacement plastic head incompatible with either the 16gm sized or professional whipping systems. The plastic head comes complete with a hot/cold heat resistant gasket. Please note, these are not designed for the heavy duty use associated with professional and catering kitchens – for this purpose we strongly recommend that our customers purchase a stainless steel whipper. Wash the plastic whipper head and warm sopay water and never use a dish washing machine.